From this section of the Apparel Magazine website, you can learn about the fashion magazine Vogue. Vogue is the fashion authority. 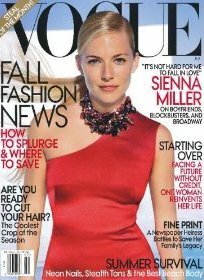 Setting the standard for over 100 years has made Vogue the best selling fashion magazine in the world. Each issue delivers the latest in beauty, style, health, fitness and celebrities and your subscription will include the must-have Spring and Fall Fashion editions. Before it's in fashion, it's in Vogue! Find Vogue Magazine on Amazon. We hope you enjoy Vogue. The Apparel Magazine website is a directory of apparel industry magazines, fashion magazines, and style magazines. In addition to providing a directory of apparel magazines, this directory provides links to apparel industry websites and fashion industry resources.